A perfect base for families or groups of friends to enjoy the huge variety of things to do in Portland and further afield. The waters around Portland are perfect for kite surfing, windsurfing, paddle boarding, SCUBA diving, angling and sailing. Why not try your hand at rock climbing, coasteering, abseiling or kayaking? Portland’s coastline is perfect for the sporty! Enjoy an abundance of excellent walks right from your doorstep with stunning coastal views. A short walk to the beach, foodstore, great fish and chips and plenty of local pubs and restaurants. 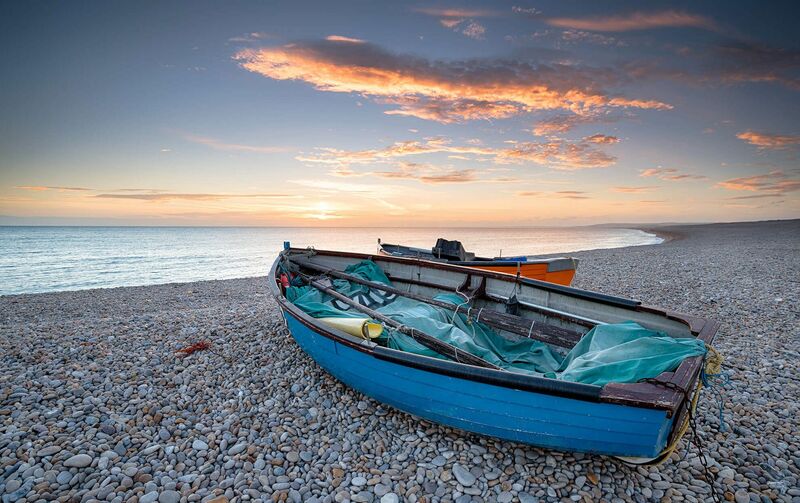 Discover Portland Museum, Tout Quarry Sculpture Park, the pirates' graveyard, or take an evening stroll along Chesil Beach. The surrounding countryside is well known as a nature lover's paradise with a variety of birds, animals and plants. The Bill is the first point of landing for millions of migrating birds and the Portland Bill Observatory is a bird-watchers paradise. Discover the beautiful Church Ope Cove with Rufus castle and XIII century church ruins, the Portland batteries plus three lighthouses including the iconic Portland Bill. There are many attractions which are just a short drive away, including Weymouth with its Sealife Centre, Abbotsbury Swannery, Monkey World, Dinosaur Museum, Lulworth Cove, Lulworth Castle and Durdle Door. Hallway with stairs to first floor. Large living room with comfy sofas and TV. Fully equipped kitchen with dining table seating four. Double aspect master bedroom with 5’ bed. There is also room for a cot. Twin bedroom with 3’ beds. There is a steep ladder which can be pulled down in the bedroom leading to a loft area with windows and equipped with bean bags, cushions and books. Suitable for older children/teenagers to chill out or even to sleep if the air bed option is used (small additional charge). 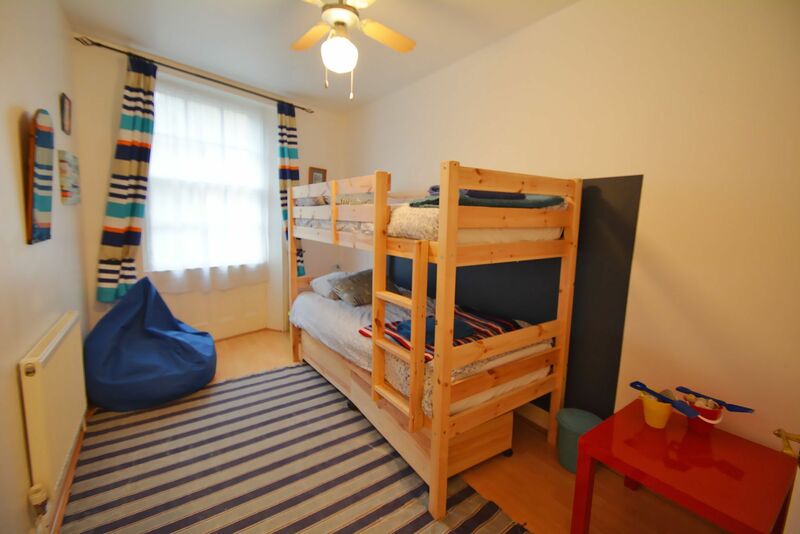 Children's bedroom with full size bunk beds. Family bathroom with a shower over the bath. Large dining area seating a maximum of 10, with a drinks fridge. 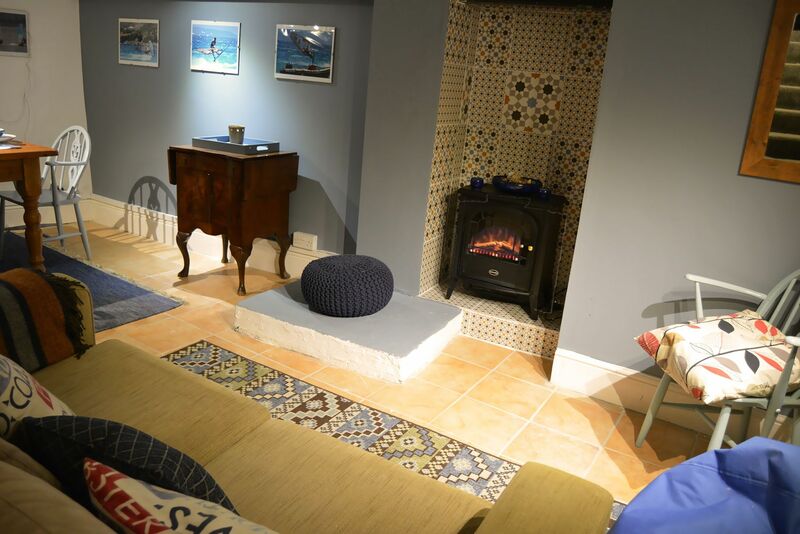 Sitting area with sofa bed and electric wood burner. An extra two guests can be accommodated (small additional charge). Laundry room and secure storage for bikes and equipment. 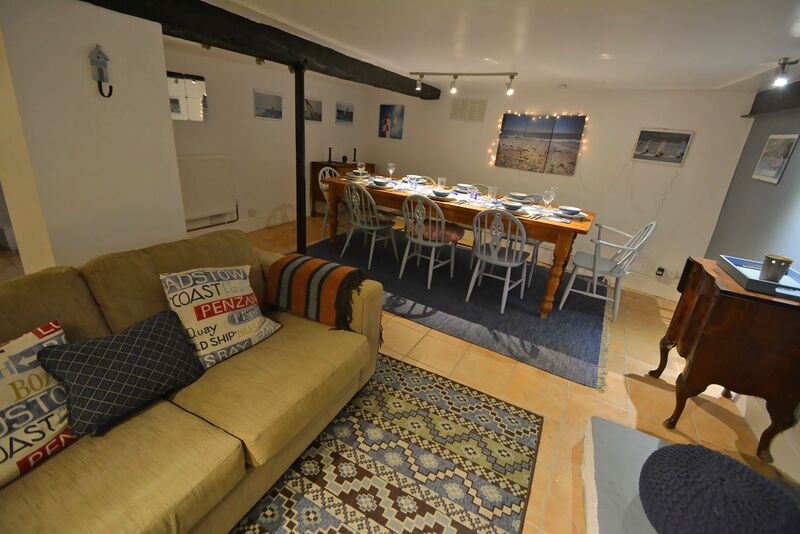 Gather up the kids, the crab nets and the wetsuits and get down to Wavecrest, our homely Dorset retreat just minutes from the sea. Its location makes Wavecrest perfect for watersports enthusiasts, walkers and cyclists alike. 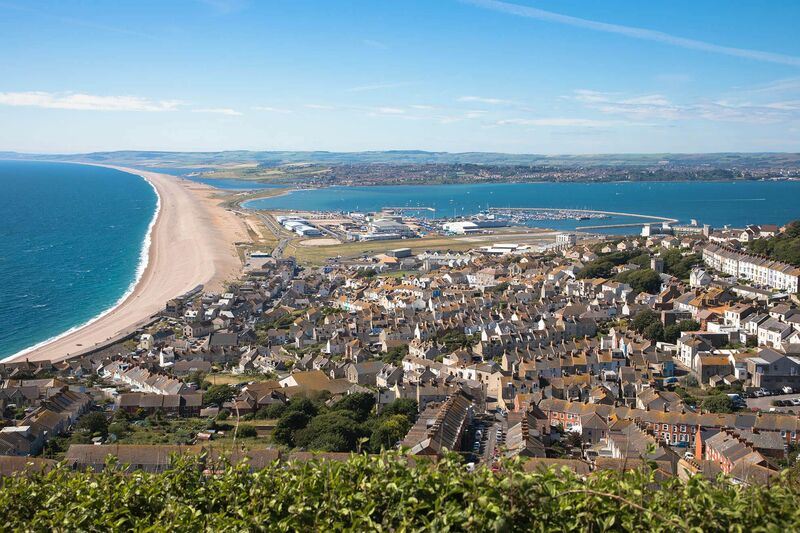 Alive with activity, the Weymouth and Portland Sailing Academy and Windsurfing Centre, Chesil Cove, the 18 mile long Chesil Beach tombolo, and the South West Coastal Path with stunning coastal views are all nearby. The spectacular sunsets from Chesil beach are not to be missed! The house has a secure storage area for your boards, sails, bikes and wetsuits. You can also bring your four legged friends who we are sure will enjoy the lovely walks! Built around 1820 from local Portland stone, our charming Grade II listed holiday home is one of the oldest in Fortuneswell village. 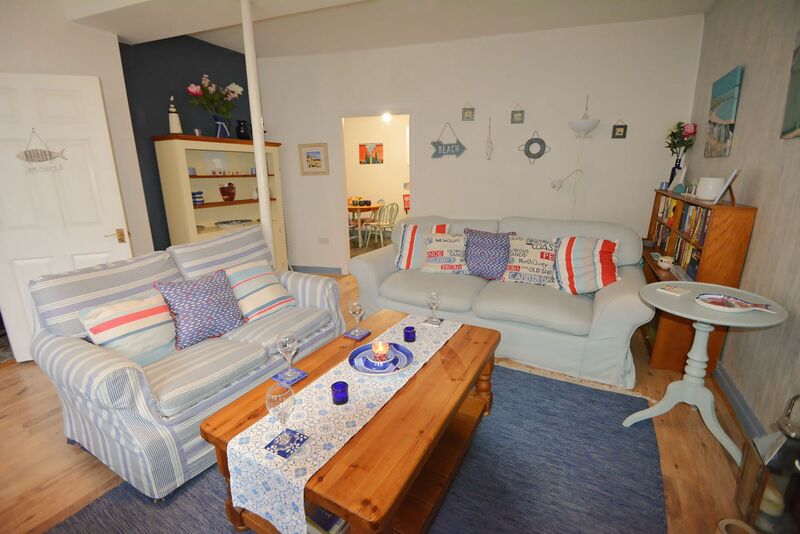 Comfortable and cosy, the seaside retreat has plenty of space to relax and recharge with family or friends. 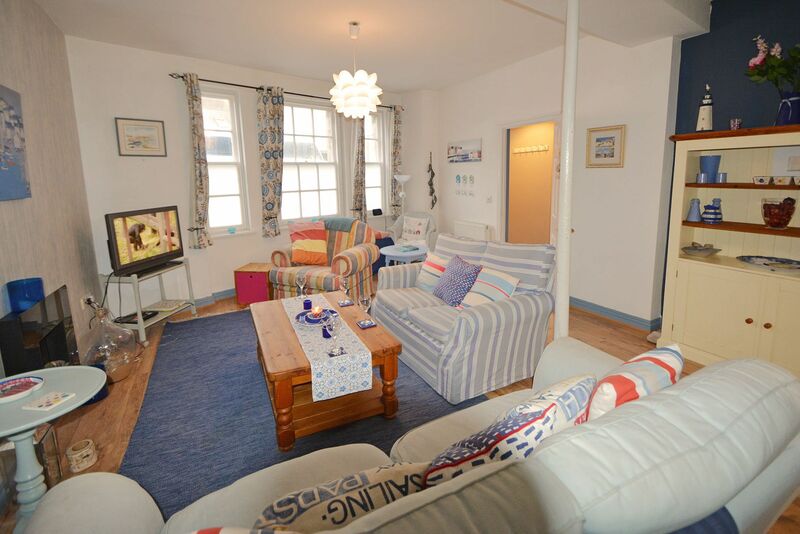 On the ground floor is a hall, large living room with comfy sofas and TV and a fully equipped eat-in kitchen. 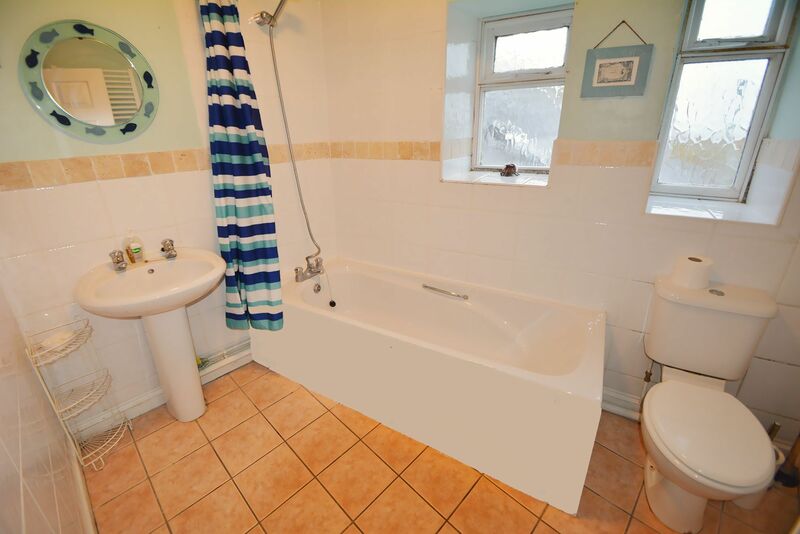 There are three bedrooms and a family bathroom on the first floor. 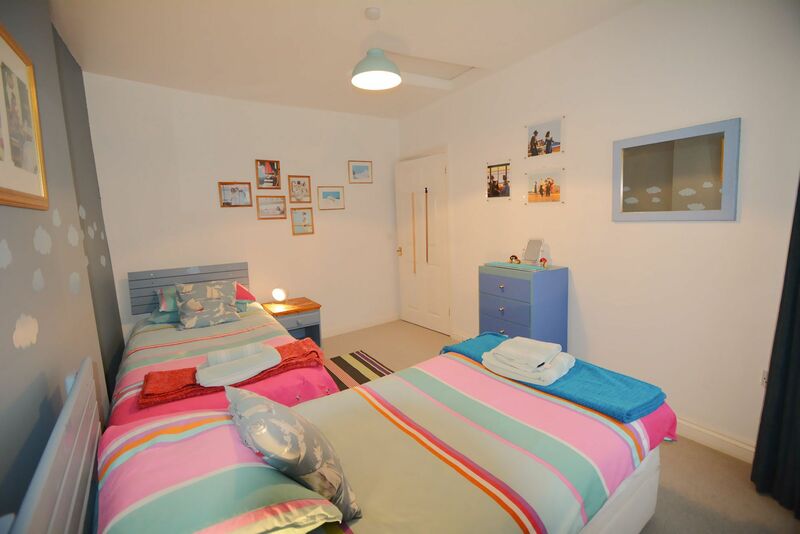 The master bedroom has a 5’ double, the twin room has 3’ divan beds and the children's bedroom has full-sized bunk beds. 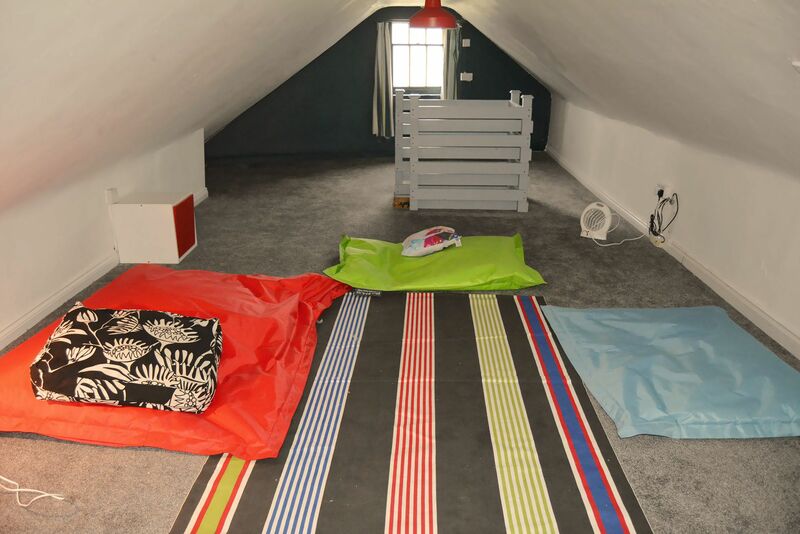 A loft ladder from the twin bedroom leads up to a large chill-out space with books, bean bags and air beds for two guests. 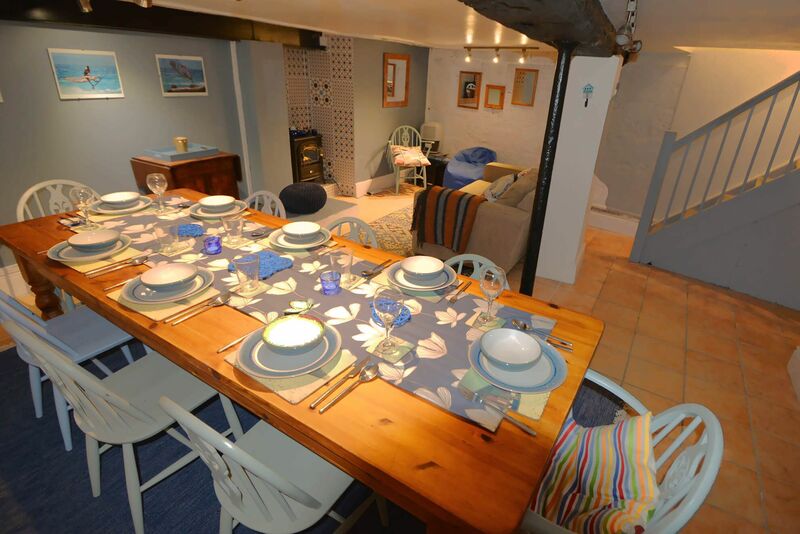 At basement level get cosy in the large dining area with a drinks fridge. Here, an extra two guests can be accommodated on a sofa bed in the lounge area with electric fire. 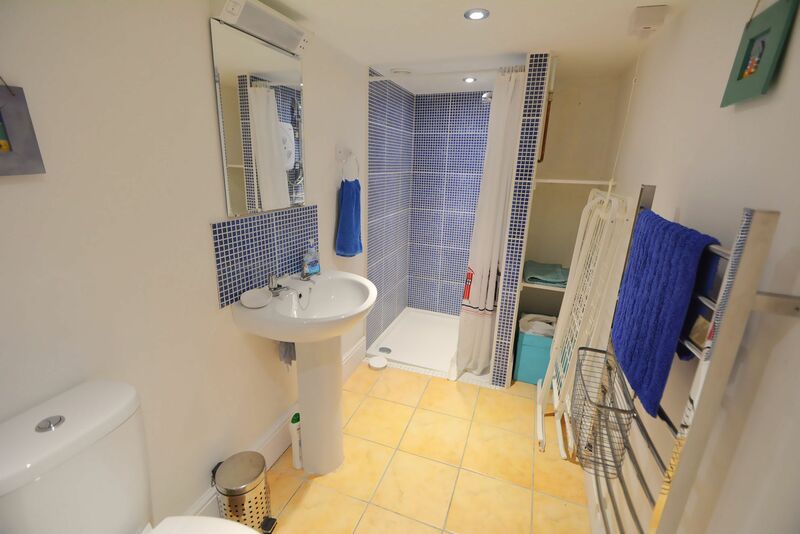 The basement also boasts a shower room. 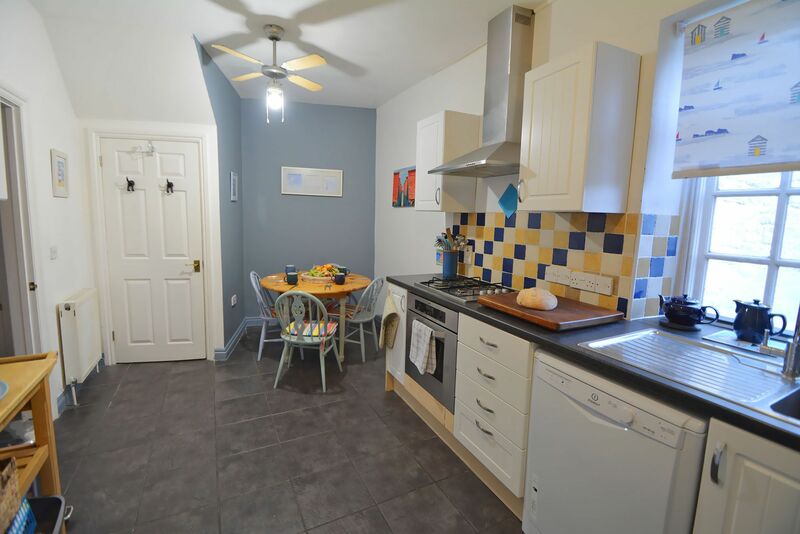 Just outside the stable door in the basement, there is a secure storage area with a washing machine and tumble dryer for guests to use as well as a dehumidifier and extractor fan to ensure a dry start in the morning. There is also space to store windsurfing, diving and other sports equipment including bikes. Although there is no dedicated parking space, there is a good-sized free 72 hour car park almost adjacent to the house. Wavecrest is perfectly situated for a ‘get away from it all’ break throughout the year. You will love all the watersports on offer on this part of the UK’s coast and the wealth of historic attractions and amenities for all ages. Steeped in maritime history and heritage, there are museums, castles and lighthouses to explore and folklore and and plenty of tales of pirates and smugglers to be told! Smaller children will enjoy Abbotsbury Children’s Farm and Abbotsbury Swannery. 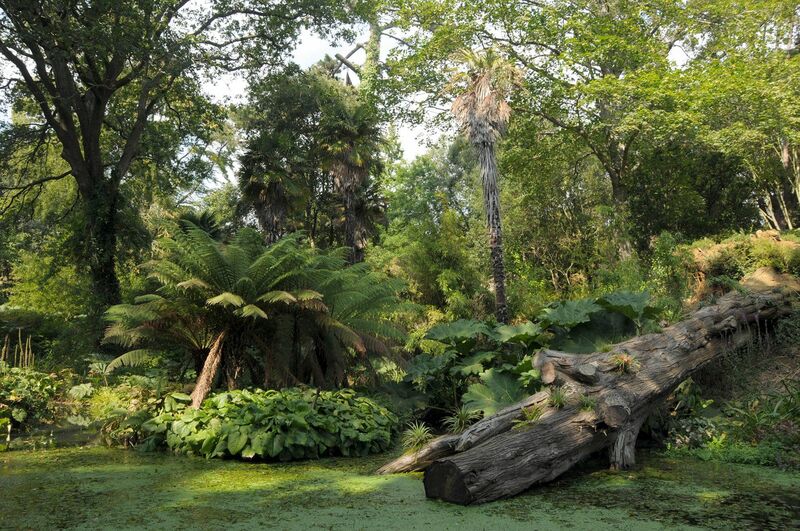 Nature lovers will enjoy Abbotsbury Subtropical Gardens. 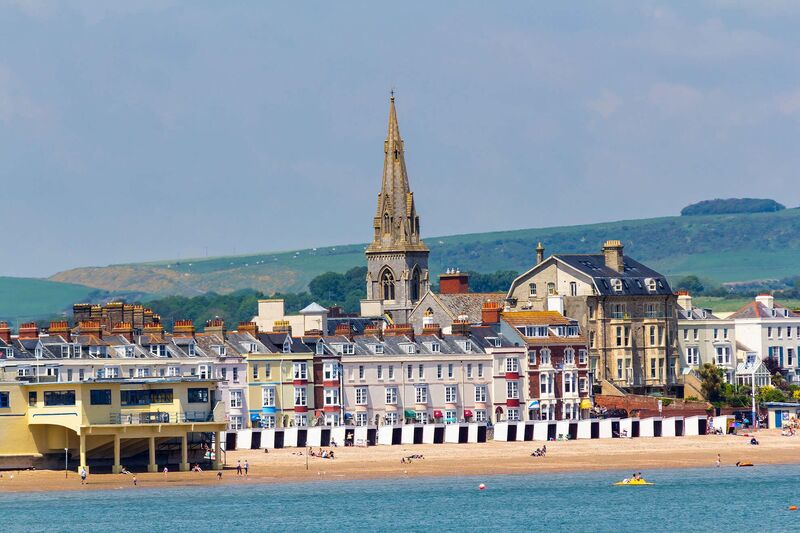 The sailing mecca of Weymouth is 5 miles away, offering the very best of vintage British seaside with its Sealife Centre and long sandy beach offering various attractions for children and adults alike. Including one of the last beach-based Punch and Judy theatres in the country. Definitely worth a watch. 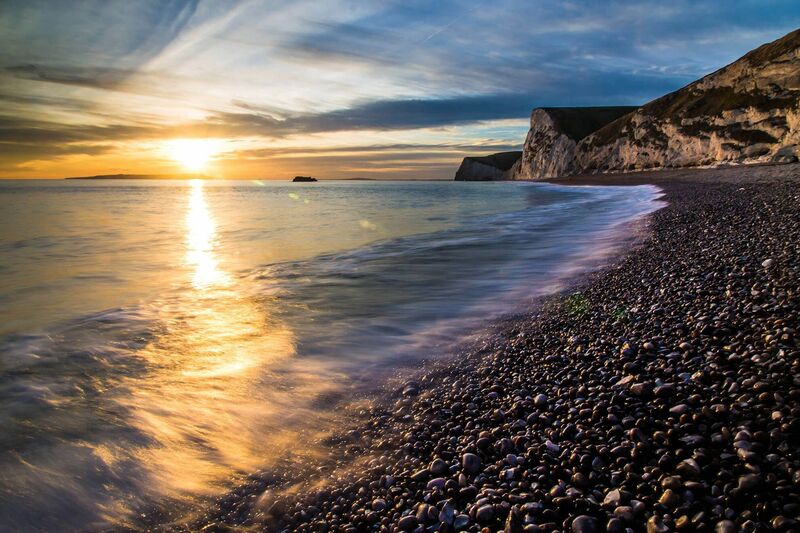 Explore the stunning Jurassic coastline - West Bay, Charmouth, and Lyme Regis to the West and Durdle Door, Lulworth Cove, Lulworth Castle and Corfe Castle to the East. You will never be short of new views to see. There are many attractions which are just a short drive away, including Abbotsbury Swannery, Monkey World, the Dinosaur Museum and Bovington Tank Museum. 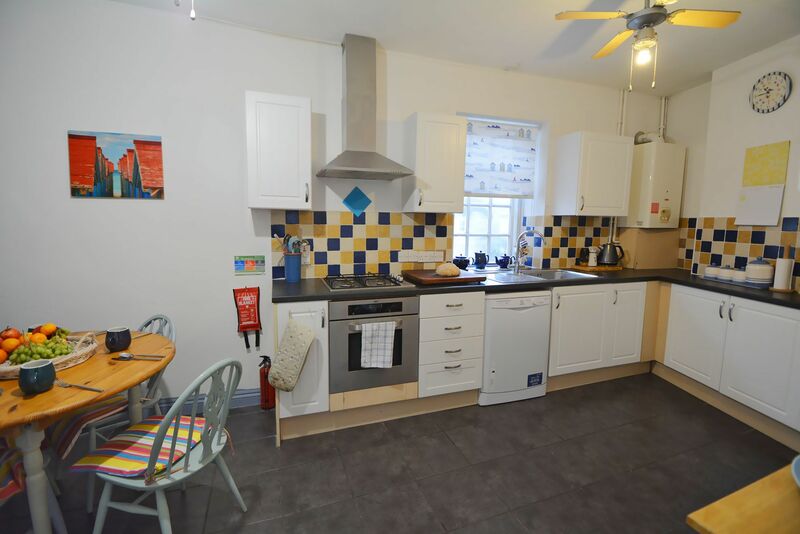 The village offers a wide range of amenities within 200 metres, including cafes, a Co-op minimart, Blue Fish cafe, Balti Island curry house, a fabulous fish and chip shop and Royal Manor Theatre. Potter down to a choice of pubs for an easy dinner, some drinks and some laughter. Or enjoy a pint in the famous Cove House Inn located at 'Dead Man's Cove', just a 7 minute walk away. As you can see, there’s no other place quote like Portland! It’s unique with such wildness and adventure ready to be explored! 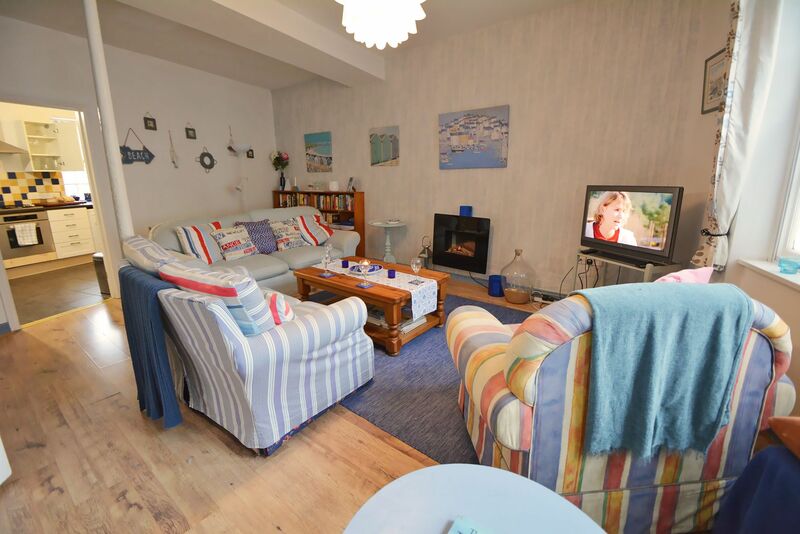 At Wavecrest, guests will find plenty of information about the property and details on places of interest to visit on Portland & around Weymouth. 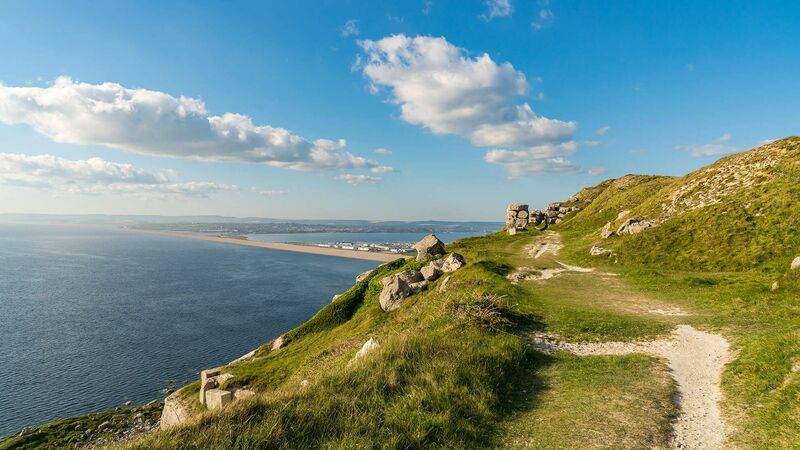 The rugged Isle of Portland is situated on a central part of Dorset's spectacular Jurassic Coast, now a World Heritage Site. 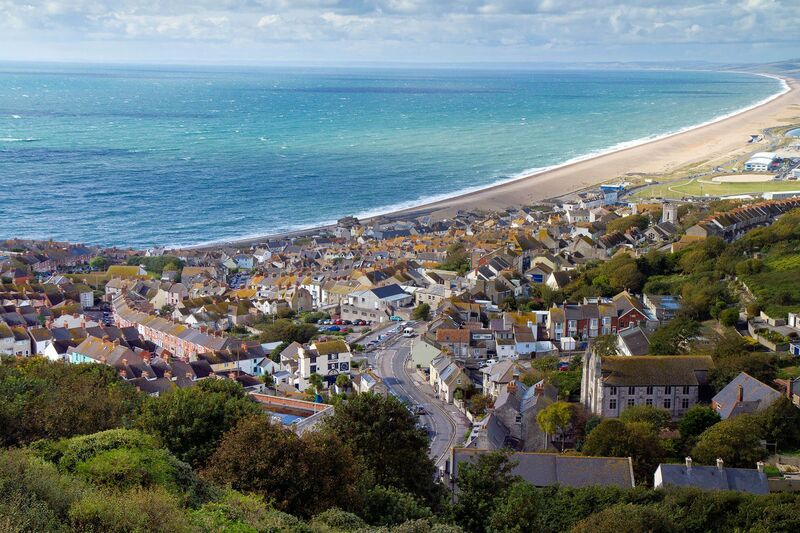 Portland’s peninsula juts out like a bird’s beak into the English Channel, joined to the mainland via Chesil Beach, a pebble spit, which stretches 18 miles towards West Bay. Most visitors only know Portland for its famous stone or the lighthouse but there’s a lot more to discover, from walks along the cliffs to exploring its varied history. Thomas Hardy wrote about it as ‘The Isle of Slingers’ due to the fact that Portlanders used to throw stones to keep Kimberlins (strangers) away. Portland is the home of British Sailing with the Weymouth and Portland National Sailing Academy hosting the sailing 2012 Olympic sailing regattas. 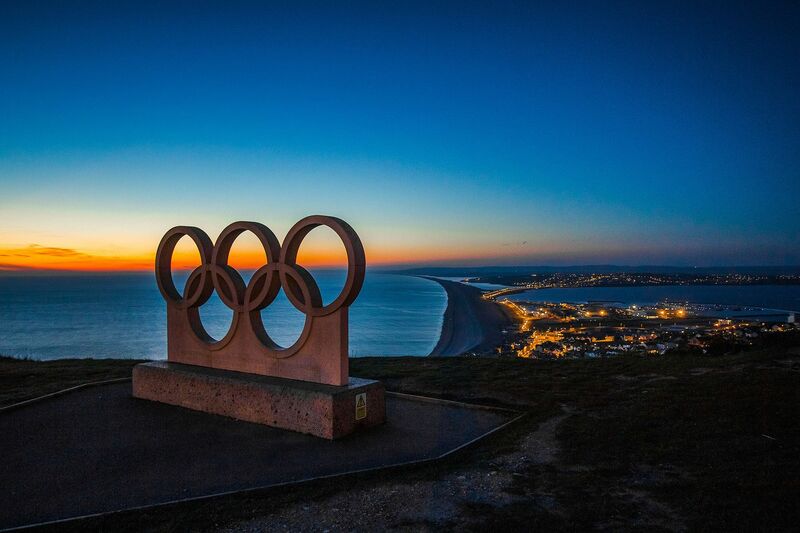 The Olympic rings stone sculpture is just 12 minutes’ walk from the property, from where you will enjoy unrivalled views over the sailing waters. Portland is rich with history. 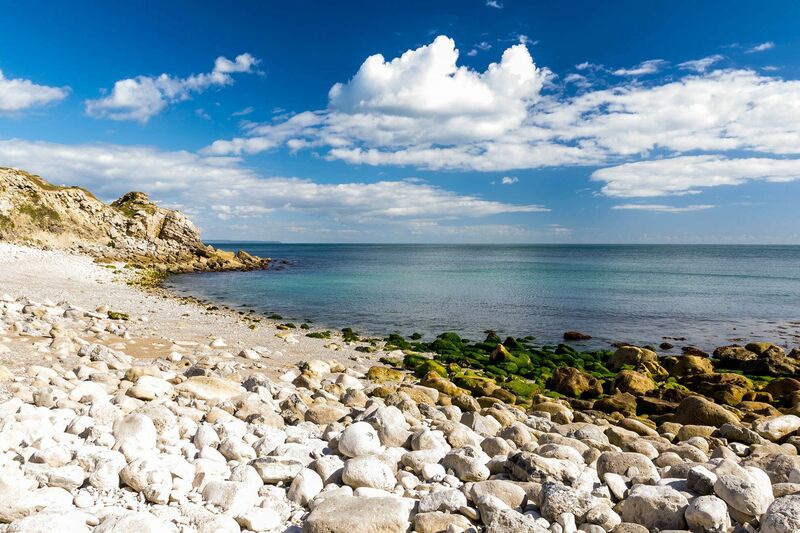 Make sure to visit Tout Quarry Sculpture Park, Church Ope Cove with Rufus castle and XIII century church ruins, Portland museum, Verne Citadel and High Angle Battery and the stunning Portland Bill lighthouse. Just one of three beautiful lighthouses in Portland. Portland’s vivid coastline boasts numerous scenic walking opportunities and is also well known as a heaven for birdwatcher and wildlife lovers. Plus a chance to try climbing, along with the array of watersport activities. Fish, beachcomb …or just relax and enjoy the wonderful scenery. Daniels fish and chips (200ft/1 minute walk) are great, especially after a busy day when you haven’t got the energy to cook! Quiddles café (0.4 miles/8 minute walk) at the end of the promenade on the Chesil beach for a crab sandwich or fresh fish dish. Balti Island restaurant (0.2 miles/5 minute walk) at the bottom of the High Street. The nearby Cove House Inn (0.4 miles/7 minute walk) on the beach front is famous for traditional pub food and ales. Blue Fish Café & restaurant (0.4 miles/8 minute walk). The Boat that Rocks (1.2 miles/22 minute walk) is a great restaurant overlooking the harbour, and a much-loved local favourite. It was inspired by the 2009 movie The Boat that Rocked which was mostly filmed on location in sunny Portland! Head to the Jailhouse Cafe at The Verne Prison on Portland (1.2 miles). Run by charitable company Expia, the cafe is staffed by risk-assessed prisoners on day release. It’s all about giving prisoners real work experience and training. Food tends to be simple classics like cod and chips, but it’s all well prepared and the views from the cafe are lovely. Billy Winters Diner (2 miles/5 minute drive) is a cafe on the beach in Portland harbour, A bit of a hidden gem, Billy Winters is known for its great food and gorgeous views of Chesil Beach. This is a lovely spot in the evening with a glass of wine as the sun goes down. Crab House Café (2.5 miles/6 minute drive) just over the causeway in Wyke Regis is a colourful, casual restaurant overlooking Chesil Beach with amazing views and a seriously enticing menu. It’s all about the crabs, of course, which are locally caught, but the Crab House Cafe also have their own oyster beds – and serve the delicacy super fresh, within minutes of leaving the water. The Smugglers Inn at Osmington Mills (11 miles) was a hangout for some of Dorset’s most infamous smuggling gangs. If you are a gin lover, you must try Conker Spirit , the first Dorset gin distillery. The botanicals include local elderberries, samphire, and handpicked New Forest gorse flowers – infusing the gin with the spirit of Dorset. . There is a very good Co-operative mini-mart just 50 yards from the house which is open from 7am to 11pm every day. For major grocery shopping, there is a large Tesco store in Easton. Jurassic Coast Farm Shop is an alternative shopping experience which delivers the finest and freshest produce at affordable prices from the countryside straight to your door! Portland is the ideal place to have a go at some of those activities you’ve always wanted to try but never been able to! Life here is wet and wonderful and there are many local providers including Adventure 4 All, Weymouth Watersports and The Official Test Centre (OTC) within the grounds of the National Sailing Academy on Portland. This is prime real estate for sailing, kite surfing, SCUBA diving, windsurfing, sea-kayaking and stand up paddle boarding. Why not make the most of Portland Bill’s natural rocky playground with a go at coasteering? Coasteering combines climbing with jumping, swimming, and other activities as you scramble through the waves, over rocks, and into some of the many caves dotted along the Bill. The isle of Portland is considered one of the best sports climbing locations in the UK, perfect for climbers of all levels. Portland Bill is a world famous climbing destination, with a huge range of cliffs to suit all abilities. Take a RIB Ride from Weymouth Harbour! You can find several companies along the harbour offering fast-paced RIB rides either to Portland, or along the coast as far as Lulworth and Durdle Door. It’s a great way to see the coastline from a whole new perspective. Risk the Big Kicker at the Dorset Snowsport Centre in Warmwell (14 miles). 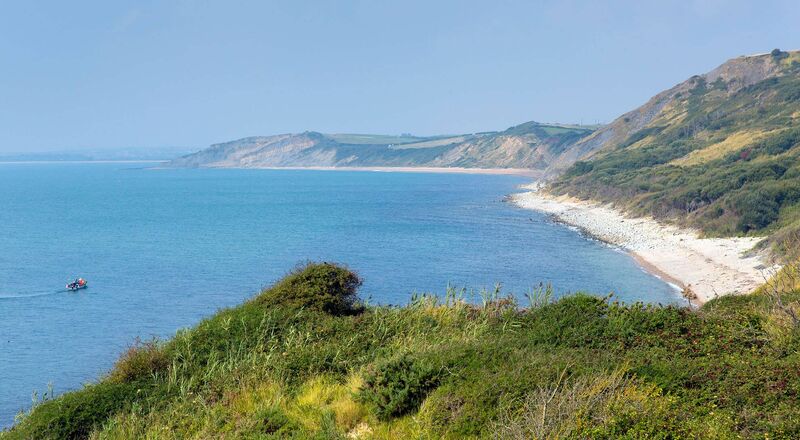 Just up the coast, Ringstead Bay (13 miles) is a prime spot for some fossil hunting on Dorset’s famous Jurassic Coast. With various clay beds to explore, the area is rich in fossils – mostly from the Upper Jurassic period. UK Llamas, New House Farm, Beaminster (30 miles) offers trekking around the county with Llamas. Moonfleet Adventure Sailing, Portland Marina is an International Yacht Training Sailing School and a real opportunity for both novice and sailor to try your hand at classic tall-ship sailing around Southern England’s stunning Jurassic coastline and the fascinating chalk downlands of The Isle of Purbeck and The Isle of Portland. FORTUNESWELL village, formerly a quarrying area, boasts a good variety of shops, pubs and restaurants, along with an intriguing maze of streets that wind their way up a steep hill to offer stunning views of the Jurassic Coast and the rolling hills of Dorset beyond. WEYMOUTH (5 miles) offers the very best of vintage British seaside. It’s just 10 minutes’ drive from the property, or take a bus ride from the bus stop at Britannia Inn, a minute’s walk from Wavecrest. Buses run every 15 minutes. Weymouth harbour is a picturesque spot lined with colourfully painted buildings, great pubs, and some quirky independent shops. Try your hand at crabbing and enjoy a boat tour, ferry or rowboat ferry service across the harbour. Weymouth’s award-winning sandy beach stretches for 3 miles with traditional beach entertainments including one of the last beach-based Punch and Judy theatres in the country. Definitely worth a watch. Or pay a visit to the sand sculpture masterpieces at SandWorld.vGo below the ocean to a magical underwater world at the Sea Life Adventure Park then climb the Jurassic Skyline Tower for 360º panoramic views of the Jurassic Coast. On a clear day you can see all the way to Durdle Door! The vibrant town centre has many independent shops as well as well-known high street names and supermarkets. Follow the three-level labyrinth of underground passageways at Nothe Fort – but beware of spooky sightings. Step Back in Time at the Tudor House, a small merchant’s property near the harbour. Lovingly restored, the museum is furnished as a 17th century home. Whilst you’re in Weymouth, don’t forget to sample some Rossi’s ice cream! OSMINGTON (10 miles) is a smart, well preserved village with grey stone cottages, narrow lanes and bright gardens. John Constable spent his honeymoon here in 1816 during which time he completed his painting of Weymouth Bay which now hangs in the National Gallery. Carved into the limestone hillside nearby is a huge white horse depicting George III overlooking the town of Weymouth – the town’s favourite patron. ABBOTSBURY (11.7 miles) is a quintessential English countryside village and makes a gorgeous day trip. Along with beautiful old buildings and the remains of the 11th century abbey which gives the village its name, there are several galleries and studios to explore. Whilst in Abbotsbury, enjoy a fabulous cream tea or even “the pigs delight” pudding at the Abbey House – just one of many tearooms and pubs to choose from. Smaller children will enjoy Abbotsbury Children’s Farm, located close to Abbotsbury Beach. Nature lovers will enjoy Abbotsbury Subtropical Gardens where you will find a rare and exotic 30-acre garden. The enchanted floodlit garden here is well worth a visit around Halloween time. DORCHESTER (12.5 miles) is Dorset’s county town exuding history and charm. Then there’s the skatepark, and museums devoted to everything from dinosaurs and Tutankhamun to teddy bears. Dorchester is home to a wealth of literary history. Just outside Dorchester you can visit Hardy’s Cottage where Thomas Hardy was born and the home he designed, Max Gate. Dorset was also home to another Hardy - Admiral Thomas Hardy - the one from Nelson’s famous last words “kiss me Hardy”. Not far from Dorchester is Hardy’s Monument to honour the admiral’s service in the Battle of Trafalgar – erected on a hill with some amazing views. It’s on a hill with some amazing views. BURTON BRADSTOCK (18.5 miles) is a pretty village with lovely Hive Beach, the Hive Beach Café, a shop and pubs. 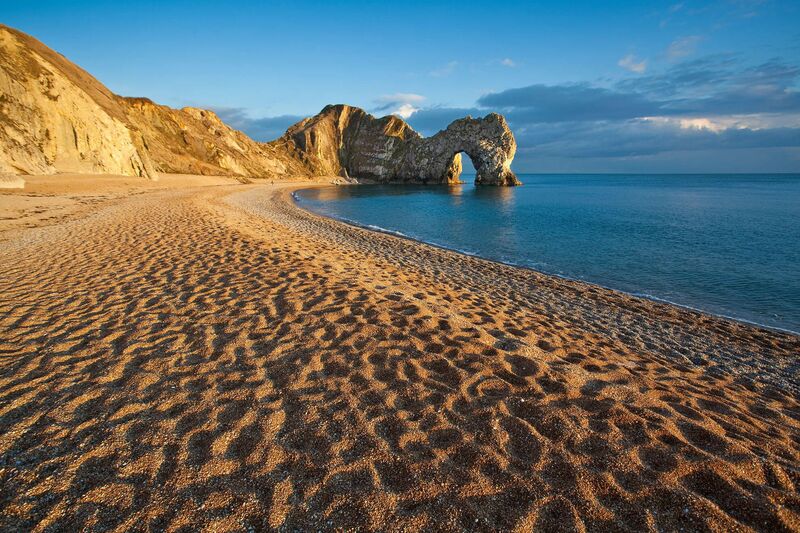 WEST LULWORTH (19.5 miles) is a pretty village showcasing another of the Jurassic Coast’s geographic marvels, Lulworth Cove - a spectacular pebbled crescent with a backdrop of majestic rock strata. A short but steep cliff path leads west to Durdle Door, a massive rock archway over the sea. Also in the immediate region is the beautiful Lulworth Estate covering 20 square miles, including a five-mile stretch of the coastline and the impressive Lulworth Castle and Park. 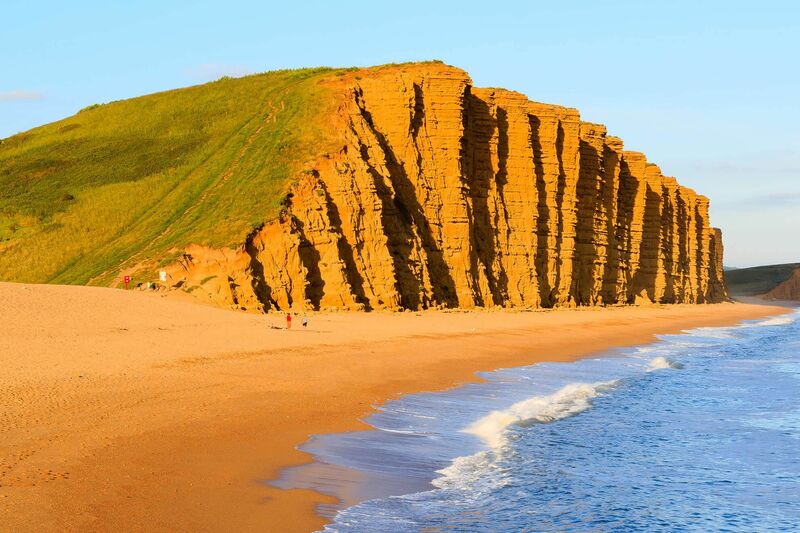 WEST BAY (20 miles), a mile from Bridport, was the dramatic Jurassic coastal setting for ITV’s series ‘Broadchurch’, with its magnificent cliffs, picturesque harbour and scenic walks on the South West Coast Path. There are plenty of lovely pubs and shops to browse and boating and sea fishing trips can be arranged at the bustling harbour. BRIDPORT (21 miles) is a vibrant town with antique markets (on the Sunday of each month), farmer’s markets, unusual and specialist shops, historic Georgian buildings and a wide range of outstanding restaurants and pubs. At the twice weekly market, local produce can be sampled as featured in the popular ‘River Cottage’ TV series. Attractions include Palmers Brewery Tours and the Bridport Arts Centre. CORFE CASTLE (27.5 miles) is an historic village approximately 20 minutes from West Lulworth. Home to the ruins of Corfe Castle, the village is picturesque and offers independent shops and restaurants. CHARMOUTH (28.5 miles), is a paradise for fishing and fossil hunting. Fossil Walks arrange guided fossil hunting at Charmouth. Visitors can also take a pleasant walk up to Golden Cap – the views are amazing. There are some lovely pubs and restaurants in Charmouth to relax and enjoy a good meal in and the Charmouth Heritage Coast Centre is worth a visit.vLYME REGIS (30.5 miles) is a historic town and picturesque seaside resort with its famous Cobb, sandy beach, harbour and charming character. Activities include the popular Fossil Walks, the Museums, Marine Aquarium and Fossil Hunting. LYME REGIS (30.5 miles) is a historic town and picturesque seaside resort with its famous Cobb, sandy beach, harbour and charming character. Activities include the popular Fossil Walks, the Museums, Marine Aquarium and Fossil Hunting. With a network of footpaths offering glorious views, Portland is the perfect place to get out and explore. Take the South West Coast Path, just 200 metres from Wavecrest, which circles the whole island. 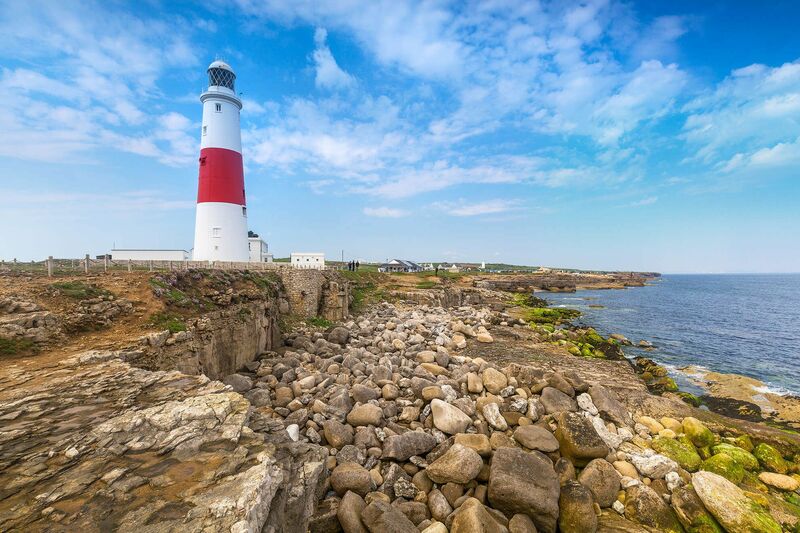 Visit the Portland Bill Lighthouse, taking in the rugged landscape and old quarries along the way. The sunsets are mesmerising in this area. Also on Portland is the Verne High Angle Battery (a 13 minute walk away), a former 19th century gun battery to protect Portland’s harbour and naval base. This historic Grade II listed site was also used to store ammunition during WWII ready for the D-Day landings. Today, the batteries are a great place for a walk – with lovely views of Portland – and you can still enter many of the underground passageways. It’s also a fantastic spot for a game of hide and seek! At just five and a half miles, the River Wey is the shortest major river in the UK. Starting in the pretty village of Upwey (9 miles), you can follow the chalk stream down through some lovely countryside and into the marshlands of the Radipole Lake RSPB Nature Reserve, before finally reaching the mouth of the river – Weymouth harbour. For one of the best cliff walks in Weymouth. 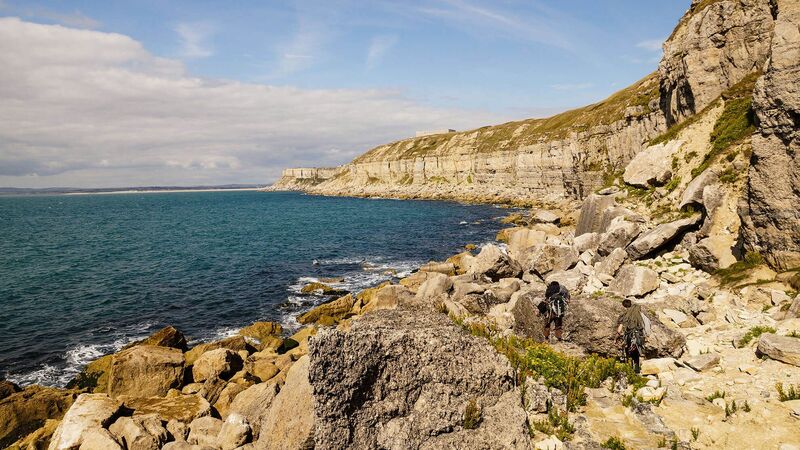 start at Bowleaze Cove (7 miles) and follow the cliff path to Osmington Mills, where the Smuggler’s Inn will be waiting for you with great local beers, tasty pub grub, and sublime views. The walk takes about an hour (about 2.5 miles). Chesil Beach is a pretty unique barrier beach, a 29km long strip of shingle beach connecting the isle of Portland to the mainland. Geographically it’s significant, as one of just three shingle structures in the UK, but more importantly Chesil Beach is a really just a beautiful place for a walk. Starting at Portland, it’s possible to walk along Chesil Beach all the way to Abbotsbury, with the sea on either side of you. During the 18th and 19th centuries, smugglers would land on Chesil Beach on moonless nights, and one of the more famous smuggling grounds was at The Fleet, the largest tidal lagoon in Britain and a Site of Special Scientific Interest due to the extraordinarily rich variety of wildlife found here. An area immortalised in the swashbuckling smuggler novel Moonfleet, you can visit the tiny church that features significantly in the book too. The whole area is wrapped in intrigue – and it’s also just a beautiful place for a walk. Eggardon Hill Fort (National Trust) (19 miles) as well as being historically interesting is a great place for a walk, with incredible extensive views. The South West Coast Path passes through Dorset’s Jurassic Coast and you are able to pick this up at most of the beaches along the coast in either direction. Each of the long distance walks can be done in shorter sections, and are well served by public transport links. If you’re interested in prehistory, The South Dorset Ridgeway is a great place for a hike. Running from West Bexington to Osmington Mills, the ridgeway offers stunning views of the Jurassic Coast but also of the inland scenery of river valleys, chalk downland, villages and farmland. Check out the Bronze Age burial mounds overlooking the village of Bincombe (9 miles) too - the views are lovely! Bincombe Hill is said to be the very hill that The Grand Old Duke of York instructed his 10,000 men to march up and down! Walk the Rodwell Trail, an abandoned railroad which once ran from Weymouth to Portland. Along the way, the Rodwell Trail passes the leftovers of station platforms, and runs through red brick tunnels. These are the only relics of a once-busy railway line that ran here between 1865 and 1965. Portland’s unique geology and its position are ideal for a variety of birds, animals and plant life. The Bill is the first point of landing for millions of migrating birds and the Portland Bill Observatory is a bird-watchers paradise. Nearby is Pulpit Rock. Its surrounding surface is known as Snail Shore and contains millions of snail, oyster and mollusc shells that was a Jurassic seabed thriving with marine life around 150 millions of years ago. Discover butterfly havens, wildflowers and even grazing goats! There are 57 species of butterfly that occur in the British Isles and half if these can be seen on Portland. Tout Quarry Sculpture Park & Nature Reserve (1 mile). Portland island is dotted with old quarries and one of them, Tout Quarry, is open to the public as a sculpture park and nature reserve. Take a stroll through the maze-like gullies of the old quarry and you’ll spot all kinds of stone sculptures produced by both well known and emerging artists. This is probably one of the most unusual things to do in Portland and well worth a visit! Portland Museum (1.8 miles), founded by Dr Marie Stopes, is housed in two picturesque thatched Portland Stone cottages, nestling above Church Ope Cove. It holds stories from the islands maritime and smuggling era, pirates, war-time and stonemasonry. Explore the ruined graveyard at the now-destroyed St Andrews Church next to Rufus Castle, above Church Ope Cove (2 miles). Known locally as the Pirate’s Graveyard, spot the graves marked with skull-and-crossbones symbols. Portland Bill Lighthouse (4 miles) is a must-visit during your stay at Wavecrest; the beautifully rugged and rocky tip of the island is a great spot to watch the waves crashing against the dramatic cliffs. Visitors can explore the old Keepers’ Cottage to learn more about the history of the lighthouse, and climb the tower itself for a fabulous view of the Dorset coastline. Nothe Fort (4.8 miles) is voted one of the spookiest places in Britain. This Victorian fort overlooking Weymouth harbour was built in 1872 and played an important role in WWII. Today it’s a lovely museum full of dimly lit underground passageways and rumours of haunting. One of the top tourist attractions in Weymouth is the Sea Life Centre (6.6 miles), a huge aquarium with outdoor and indoor exhibits featuring local and exotic marinelife, including the Turtle Tunnel, which is home to several rescue turtles from Florida. Smaller children will enjoy Abbotsbury Children’s Farm (11.5 miles), located close to Abbotsbury Beach. Kids can feed, cuddle and ride. The onsite café is a popular spot for lunch. Abbotsbury Swannery (12.5 miles) is the only place in the world where you can walk through a nesting colony of Mute Swans. You will see the cute and fluffy cygnets and may even catch them hatching if you visit between mid May and the end of June. At Abbotsbury Subtropical Gardens (12.5 miles) you will find a rare and exotic 30-acre garden including an enchanted floodlit garden. Their full events programme includes outdoor concerts, theatre performances, Easter egg hunts and brass bands. Introduce your chimps to their mates at Monkey World (20 miles). This internationally-acclaimed ape rescue centre is set in 65 acres of beautiful Dorset woodland and home to over 250 primates. The park is home to more than twenty species and all of them have been rescued – from labs, circuses, pet shops, or TV. Bovington Tank Museum (20 miles) houses the world’s broadest and best collection of tanks. Follow the Tank Story, take a look at almost 150 tanks in the Discovery Centre, and check out Tank Displays. Swanage Railway runs steam and diesel trains from Norden and Corfe Castle into Swanage and back. Norden Park and Ride (27 miles) offers the simplest parking option. Portland Castle (1 mile), one of Henry VIII’s finest coastal forts, was built in the 1540s to protect against French and Spanish invasion. Today, it has been lovingly restored as a museum making for a fabulous family day out. You can tour the Tudor kitchen , step inside the Great Hall to come face to face with King Henry himself and and become a Tudor Soldier or Royalist Gunner when you try out the outfits and armour in The Armoury. Enjoy stunning sea views from the gun platforms, and get close to the powerful cannons. Rufus Castle (2 miles) is also known as Bow and Arrow Castle and is a ruined 12th century grade I listed castle overlooking Church Ope Cove. The ruins today are the remains of the late 15th century castle built on the earlier remains. Discover Sandsfoot Castle (4.4 miles), built in 1539 in Weymouth – almost directly opposite Portland Castle – to provide defence. Today, it’s a crumbling ruin compared to Portland’s still-intact castle, but it’s in a gorgeous location with some fab views, and it’s also a great spot to explore with kids or history buffs. English wine has really started to take off in recent years, and Dorset is home to several fantastic vineyards that are well worth a visit. Little Waddon Vineyard (10 miles) is a small artisanal vineyard (formerly known as Portesham Vineyard). You can visit the vineyard for tours and tastings. Other accessible vineyards include Langham Wine near Dorchester (20 miles) and Furleigh Estate near Bridport (25 miles). The Quayside Music Festival takes place around Weymouth Harbour on April bank holiday (5 miles). Dorset Food Fair, Abbotsbury Subtropical Gardens (12.5 miles). Easter Egg Hunts, Abbotsbury Subtropical Gardens (12.5 miles). Quayside Music Festival takes place around Weymouth Harbour on Maybank holiday (5 miles). The Dorset Knob Throwing Festival, Kingston Maurward College (14.5 miles). Wessex Folk Festival, Weymouth Harbourside (5 miles). Vintage Tractor & Stationary Engine Club Rally, Melplash Showground (21 miles). Bridport Food Festival, Asker Meadow, Bridport (21 miles). Beaminster Festival of Music & Arts, Beaminster (27 miles). Outdoor theatre, Abbotsbury Subtropical Gardens (12.5 miles). The annual Dorset Seafood Festival Weymouth Harbourside (5 miles). The Big Mix Music Festival, Lyme Regis (30.5 miles). Bridport Charter Fair, Bridport (21 miles). Jurassic Fields Music Festival, Bridport (21 miles). Lifeboat Week, Lyme Regis (30.5 miles). Raft Race (RNLI) at West Bay (20 miles). Weymouth Carnival on the third Wednesday of August. With a funfair on the seafront, fireworks at night, and a procession featuring the annual Carnival Queen, and the spectacular show from the RAF Red Arrows (5 miles). Lyme Regis Regatta & Carnival Week, Lyme Regis (30.5 miles). West Bay Day (20 miles). Bridport Carnival, Bridport (21 miles). Burton Bradstock Festival of Music & Art, Burton Bradstock (18.5 miles). Lyme Folk Festival, Lyme Regis (30.5 miles). Buckham Fair Pony & Dog Show, Stinford Lane, Beaminster (28 miles). RNLI West Bay Fun Day (20 miles). Melplash Agricultural Show, Melplash Showground (21 miles). Candles on the Cobb, Lyme Regis (30.5 miles). Symondsbury/Symene Fete, Symondsbury (22,5 miles). Bridport Hat Festival, Bridport (21 miles). Food Rocks Festival, Lyme Regis (30.5 miles). Autumn Charity Garden Fair at Mapperton, Mapperton House, Beaminster (27 miles). Lyme Regis ArtsFest, Lyme Regis (30.5 miles). Weymouth annual yacht regatta (5 miles). is a must for sailing enthusiasts! Dorset Food Week, various locations throughout Dorset. Weymouth Beach (5 miles). hosts the annual Beach Motocross event run by the Weymouth & Portland Lions Club. The biggest amateur motocross event in the UK – with over 300 riders taking part. The Enchanted Illuminations, Abbotsbury Subtropical Gardens (12.5 miles). The Enchanted Illuminations Fright Night, Abbotsbury Subtropical Gardens (12.5 miles). Bridport Literary Festival, Bridport (21 miles). Bridport Annual Christmas Tree Festival, Bridport (21 miles). Eype Makers Christmas Market, Highlands Leisure Park, Eype (22 miles). Weymouth’s New Years Eve celebrations have been ranked among the best in Europe. With over 20,000 participants most years, this is one of the biggest fancy dress parties in the UK (5 miles). Up to two well behaved dogs on request. There is no additional charge for pets. 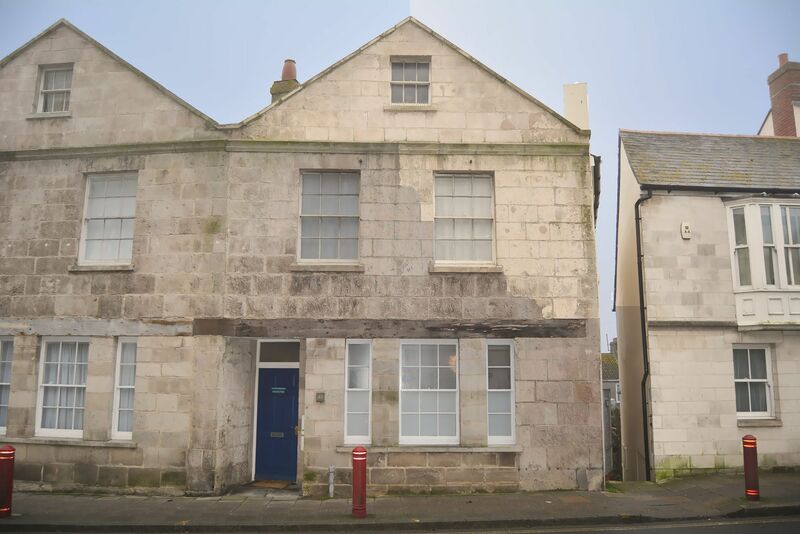 As Wavecrest is situated on the Fortuneswell main street – opposite the bus stop – there is not a dedicated parking space but there is a good-sized free 72 hour car park almost adjacent to the house. The entrance to this is the first turning on the right (Hambro Road) about 100 metres past the house. You can nearly always find a space in here and other nearby alternatives include a second small free 72 hour car park about 100 metres on the left hand side or down Hambro Road itself. Minimum stay 7 nights Saturday to Saturday during Summer High season. Minimum stay 5 nights during all other periods except Christmas & New Year which is 4 nights. All prices are for up to and including 6 guests. 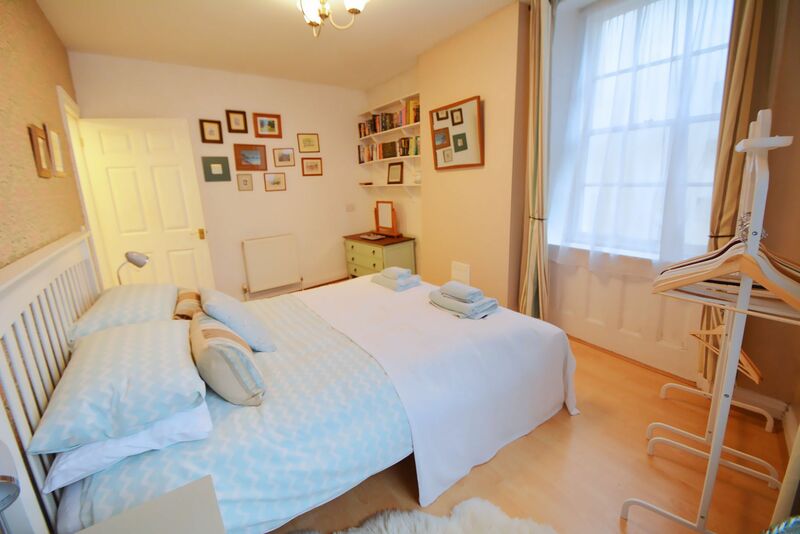 Up to 4 additional guests can be accommodated on the double sofa bed in the basement and two full size air beds in the loft at £10.00 per person per night. Refundable guest damage deposit of £100.00. A welcome pack includes tea, coffee, sugar and milk. The loft area has low ceilings and can only be accessed via the steep ladder. It is unsuitable for small children due to the steep ladder.